Nicotinamide adenine dinucleotide (NAD) is the coenzyme form of the vitamin niacin. Most biochemical reactions require protein catalysts (enzymes). Some enzymes, lysozyme or trypsin, for example, catalyze reactions by themselves, but many require helper substances such as coenzymes, metal ions, and ribonucleic acid (RNA). Niacin is a component of two coenzymes: NAD, and nicotinamide adenine dinucleotide phosphate (NADP). NAD + (the oxidized form of the NAD coenzyme) is important in catabolism and in the production of metabolic energy. NADP + (the oxidized form of NADP) is important in the biosynthesis of fats and sugars. one nicotinamide unit (derived from niacin). (See Figure 1a.) The adenine, ribose, and phosphate compounds are linked exactly as in the nucleotide molecule adenosine diphosphate (ADP). In the case of NAD + , the nicotinamide ring has a positive charge on its nitrogen atom: This is the + indicated in the designation NAD + . This is often confusing, because the molecule as a whole is negatively charged due to the presence of the phosphate groups, as shown in the figure. In 1934 Otto Warburg and William Christian discovered a variant of NAD + in human red blood cell extracts (Metzler, p. 466). 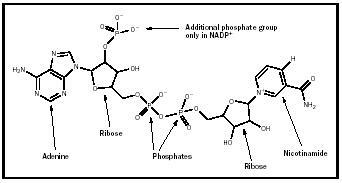 This form, called NADP + , contains a third phosphate group attached to one of the ribose rings (see Figure 1b). biosynthetic and energy-producing functions of NADP + and NAD + . NAD + and NADP + act as electron acceptors in oxidoreductase catalyzed reactions; NADH and NADPH act as electron donors. The transfer of hydrogen to NAD + is stereospecific , and dehydrogenases are now classified as H A side or H B side enzymes, according to the "side" of the NAD molecule they act on. Alcohol dehydrogenase, which catalyzes the reaction shown in Figure 2, is an H A side enzyme, as it promotes the transfer of hydrogen from ethanol to the "A position" of NADH. This specificity was somewhat unexpected, as the flat nicotinamide group can be approached (by a dehydrogenase enzyme) equally well from either side in solution, when NAD + is bound to the enzyme; however, one side or the other of NAD is more approachable and therefore preferred. Both NADH and NADPH have a distinctive signal in ultraviolet spectroscopy . This signal is lost when NADH or NADPH is oxidized (to NAD + or NADP + ). This phenomenon has been employed by thousands of scientists to monitor a wide variety of enzyme-catalyzed reactions. Figure 2. Reduction of NAD to NADH by alcohol dehydrogenase. Note R stands for the remainder of the NAD+ and NADH molecules not shown in the figure or changed in the reaction. SEE ALSO Coenzyme ; Enzymes ; Nicotinamide . Magill, Frank (1991). The Nobel Prize Winners: Physiology or Medicine, Vol. 1. Pasadena, CA: Salem Press. Metzler, David E. (1977). Biochemistry: The Chemical Reactions of Living Cells. New York: Academic Press. They (researchers) are getting closer to the answer as to what it is that makes all of us tick! A pill that can make you healthier as opposed to a pill that can lengthen your life is great!